Is this cipro poisoning or MS? On Feb 25, I went into urgent care for a possible uti. I peed in the cup and was told "yes..you do have a uti and I will give you a great antibiotic to wipe it out". The doctor prescribed cipro. I took a total of 5 pills and then received a call from the clinic telling me to stop because I in fact did not have a uti. Well, in retrospect...I had a tough March. Very emotional, felt like I was in a fog, body felt "heavy", etc. On March 29th, I noticed my forehead and around eyes was numb. This feeling persisted and today...almost four weeks later, I still have it. However, I also have moments of extreme chills, tingling in extremities, burning on upper back and neck, times of extreme body aches, lack of appetite, etc. I have been to the doctor...she treated me for a sinus infection which did seem to help the facial numbness for a week, but it has never completely gone away. She doesn't feel this is MS, but has referred me to a neurologist. All my bloodwork...which is extensive, all came back good. Could this be the Cipro? Comments for Is this cipro poisoning or MS? While I appreciate your problem, you are asking a question that is impossible for me to answer. I am not a doctor, let alone a neurologist and even if I were I can't magically figure out whether you have MS or not without knowing you, meeting you or doing testing. And since you are going to be seeing a neurologist shortly, then you can ask the neurologist if you have MS. However, IF you wanted to know if your symptoms COULD be due to Ciprofloxacin Side Effects unfortunately I can't even tell you THAT since there is no test for Cipro toxicity except for you knowing that you did not have these symptoms before you took Cipro, then after Cipro you did. Otherwise, there is absolutely no way at this point in time to definitely determine whether your symptoms are being caused by Cipro. And your neurologist is CERTAINLY not going to help you decide whether or not Cipro is causing your symptoms since most doctors don't 'believe' that Cipro can cause these types of problems. HOWEVER, if you were to ask if treating your problem AS IF IT WERE Cipro Toxicity, which is all that you can really do anyway, would help with the symptoms that you are experiencing, I can definitely tell you with 100% certainty- MAYBE! If you asked if you were to actually have MS and if you treated it exactly the same way that you would if you were to have Cipro poisoning, if THAT might help your symptoms and the answer would also be a definite maybe. So, you really have two choices. 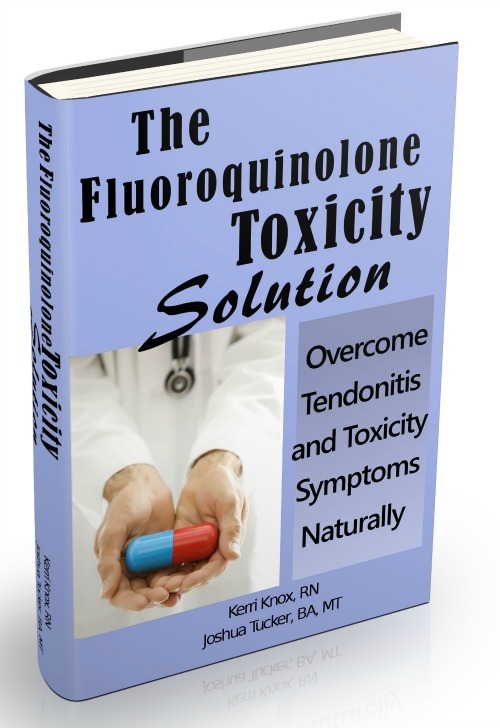 You can do nothing and wait until you see the neurologist and hope and pray that you don't have MS and then treat it like Cipro Toxicity using my book The Levaquin Tendonitis Solution. OR you can realize that EVEN IF YOU DO have MS, it is not a death sentence or even an 'incurable disease' like the doctors tell you it is- and you would get my book The Levaquin Tendonitis Solution and follow the protocol for Quinolone Toxicity and realize that if you came to me to get help for your MS, I would change VERY VERY little about the protocol in order to help you manage and possibly even reverse MS.
And maybe if you start on the protocol now, by the time that you go see your neurologist, your symptoms will have resolved and you won't even care much about what he has to say anyway.